The Apple Pencil, which is frustratingly hard to come by, is also impossible to repair. 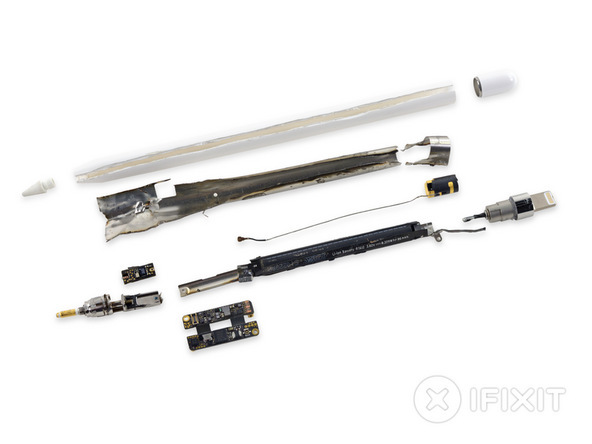 As they’re wont to do, the team at iFixit pulled the Pencil apart for little reason other than to see what was inside. As expected, there’s a lot of tech in there. Of special note is a tiny folded logic board, weighing one gram. There’s also plenty of metal encasing the various components, giving the Pencil a heftier feel than you might think. The nib sensor can be swapped, so at least you can replace the most important bit. But, like a normal pencil, Apple’s Pencil can’t be cracked open without destroying the entire thing (and duct tape won’t help; thanks for nothing, Apple!). Too much solid plastic and metal make repairability impossible, so don’t drop it or use it in pencil wars. Apple is tolerant of a lot when it comes to replacing hardware, but there are some things you just can’t explain away.